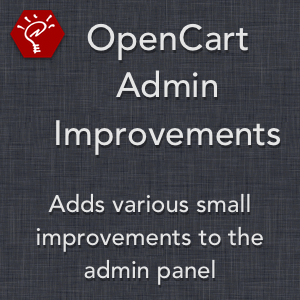 All Pages: Adds the extension sub-areas to the left-hand Extensions > Extensions menu. All Pages: Allows for filtering by hitting the Enter key, instead of having to manually click the "Filter" button. Catalog > Products: Allows for partial Name and Model matches when searching. Extensions > Extensions: Changes the extension selector on the extension sub-area pages to show all options at once, for quicker navigation. 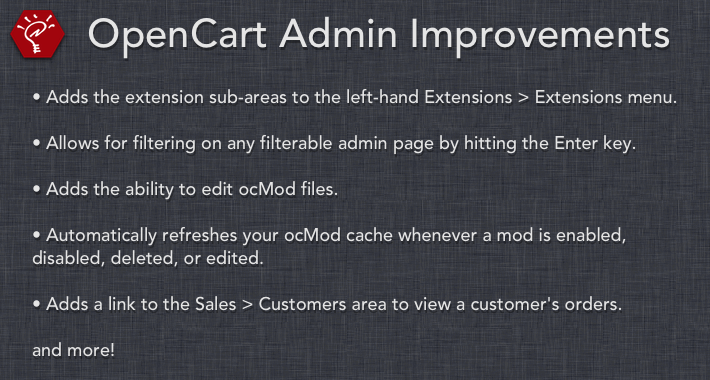 Extensions > Modifications: Adds the ability to edit ocMod files. Extensions > Modifications: Automatically refreshes your ocMod cache whenever a mod is enabled, disabled, deleted, or edited. Extensions > Modifications: Adds a fix for errors sometimes generated when refreshing the ocMod cache on a localhost Mac installation. Sales > Customers: Allows for partial E-mail matches when searching. Sales > Customers: Adds a link for each customer to view their orders, based on the customer name. System > Maintenance > Error Logs: Expands the error log window to show more rows. System > Maintenance > Error Logs: Suppresses unnecessary "unlink" errors.